By Canvas Digital Digital Comments Off on How fast is your website? We all know that the design, functionality, layout and content is key to making a website great but are you overlooking one of the most important factors of usability and user experience, how fast your site and pages load. The simple answer is yes, optimizing your page speed is more important now than ever before. Fast loading sites perform better on every front, better user experience, more engagement, higher conversions and even higher search rankings. Trust us, you would be surprised how much slow page speed can affect your search rankings. All search engines like Google want to provide their users with a great user experience and a fast site will improve the overall experience, site quality and increase the user’s satisfaction. 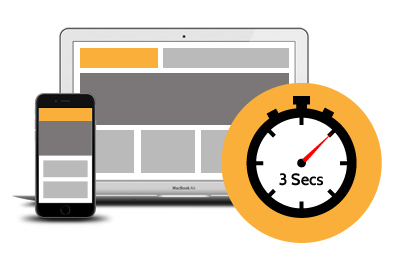 In our experience, and with lots of research, we find on average most users expect a site to load within 4 seconds or less. Some good guidelines to follow when checking your site’s page speed are: if your page loads in under 1 second, that is excellent; under 3 seconds, that is perfect; 3 to 7 seconds, this is average but you could have room for improvement; over 7 seconds, this is not great and you could be losing users and conversions. Are you thinking about mobile users? If not then you should be. With mobile internet usage expecting to overtake desktop usage, it’s never been more important to think about faster site loading times. Most mobile users will be using a slower connection and in most cases be out and about trying to access information fast. Just imagine you’re in a hurry, trying to find a telephone number or an address for a hotel or restaurant and every page on their website is taking forever to load. How frustrating and annoying to the user would this be. They may even give up and look at a competitor’s site that is quicker to load and access this information. Remember, everybody deserves a fast web experience. Improving your site speed should always be a serious factor in your overall site optimisation. In turn, this will boost your user’s confidence and trust in your site. If you want to find out more about how we can help you increase your site’s speed and performance, give us a call!